Water is becoming scarce due to the ever-growing population. We waste several thousands of gallons of water every day without even knowing it. For instance, a conventional toilet uses 5-7 gallons of water during a flush and since an average person flushes more than 5 times a day, it adds up to 30 gallons of water per day. The solution to this problem comes with dual flush toilets. They consist of two flush buttons that send down water with twice the intensity and clear all types of waste in one go. It eliminates the need to activate a second flush, thus saving gallons of water every year. It is important that you pick the best dual flush toilet to enjoy all the benefits they have to offer. You can save about 13,000 gallons of water every year by merely changing your toilet, according to a report published by the EPA (the United States Environmental Protection Agency). This luxurious and compact dual flush toilet consumes less water but drains waste like a pro. It might be a bit more expensive than other products on the list but is worth the price. Temperature controlled seat (can be heated). Can be controlled with a remote. This particular dual flush toilet uses a rare ewater+ technology that transforms common tap water into a safe compound. This transformed water has the same properties as household bleach. As a result, your toilet will clean itself when you flush. Also, you do not have to worry about any side effects as this chemical water reverts back to normal after 2 hours of no use. You will also see no waste sticking to flush walls thanks to a nonporous glaze. After a single flush, you will see the toilet as clean as ever. 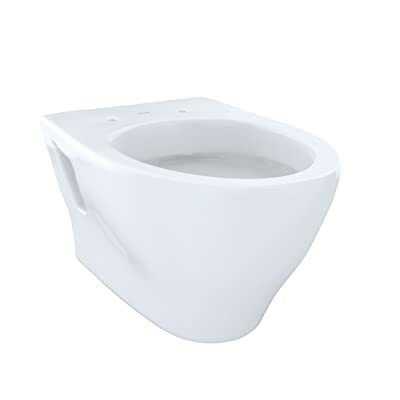 The toilet incorporates offers auto flush and auto close lid functions as well. You can set the autoflush to 5,10 or 15 minutes after the user has walked away. Moreover, it also has a sensor on the lid which removes the need to manually open the lid. This feature makes it useful for pets as well. You will not feel uncomfortable using it. This is truly a smart device and also has a warm air dryer feature to make you comfortable during winters. 3 year residential and one-year commercial warranty. Can be operated via a remote (flush, deodorizer, etc). 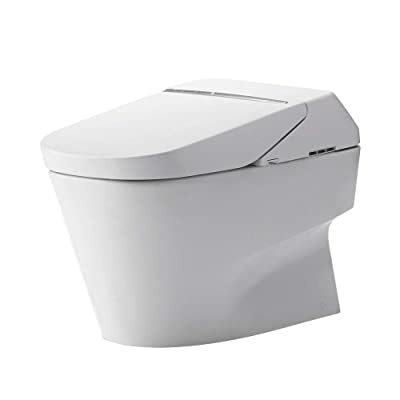 Toto Neorest 700H Dual Flush Toilet, Cotton White can be a good option if you need a smart toilet. It looks good, has a bunch of features, and also helps save water. 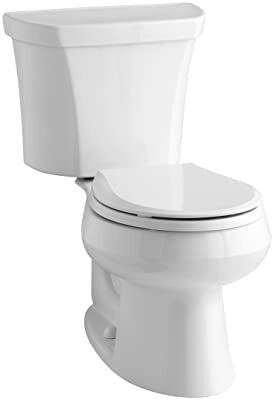 If you want a dual flush toilet that has a clean and luxurious look then bring home Woodbridge T-0019. It has a powerful flushing mechanism that does the job within seconds. Drains waste in one go. Saves 16,500 gallons of water. One of the best things about this toilet is its durability. The toilet seat hinges are made up of top-notch steel and form a strong grip. As far as the flushing system is concerned, it is super quiet thanks to the siphon flushing design. This flush is super powerful and capable of clearing out waste in a single go. Apart from that, it is also very quiet when operational. In fact, it can help you save 16,500 gallons of water each year. You do not have to worry about leaks either as the fittings are top notch. This beauty is easy to maintain with little to no risk of clogs. Plus, cleaning is also easy as it has no grooves or corners. You can also remove the seat while cleaning. 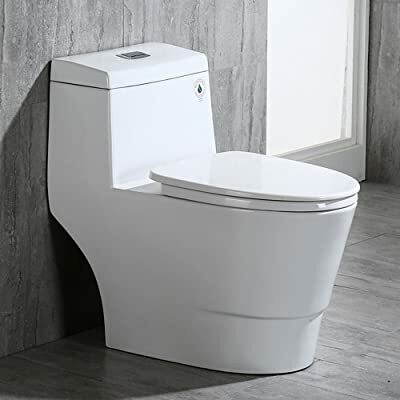 This toilet comes in a single piece and includes a pre-installed toilet seat, wax ring, floor bolts, water fitting, hand wrench tool, and a guide/manual on how to install it. You will not have to buy additional equipment to install it. Comfort is yet another plus point of this toilet as it stands at a height of 18 inches, making it a breeze for adults to sit and stand up when done. Chrome flush buttons last longer than conventional buttons. It meets low flow efficiency standard. Hinge cover is made up of solid brushed metal. Can be a bit difficult to install as instructions are poorly written. WOODBRIDGE Cotton T-0019 is a compact toiler that can fit even the smallest of spaces. Consider it if you’re looking for a smart flush toiler. This dual flush toilet is a combination of leading edge technology and design. With an advanced dual flush technology, it can clear out waste in a single turn. Two flush options (liquid waste flush and solid waste flush). Uses 20% less water than conventional toilets. It’s the right fit for compact bathrooms as it weighs 45 pounds with a dimension of 29.2 x 28.5 x 18 inches, The toilet is cleverly designed and has a round bowl seat that saves even more space. Its main highlight is the dual flushing system. You can either choose to flush out liquid waste (1.1 gallons of water) or pull the full lever to drain solid waste (1.6 gallons of water). Choosing the right option will help you save a lot of water on a daily basis. This dual flush toilet can coordinate with other Wellworth products and transform your bathroom into a thing of beauty. It comes in four amazing colors including white, almond, biscuit, and black. You can choose the color that blends well with the look of your bathroom. Choose between a full or a partial flush. Doesn’t come with a seat. KOHLER K-3987-RA-0 Wellworth lets you choose between a partial or full flush, thus giving you the option to save even more water. 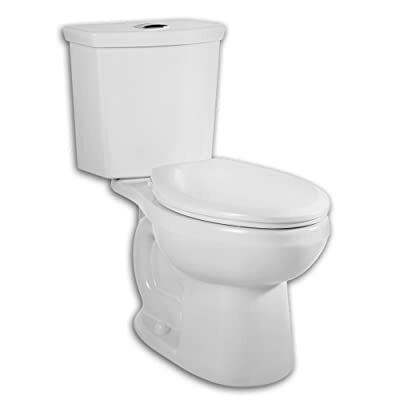 The American Standard H2Option is another dual flush toilet designed to use minimal water. It’s a compact and premium looking toilet that is meant to run for years. Pressurized rim adds power to the flush. Comes almost preassembled and requires 30% less installation time than conventional toilets. The best feature of this dual flush toilet is its EverClean microbial surface coating that allows no stains, waste or debris to remain stuck to the surface. As a result, it does not stink or looks dirty. Plus, there is also little to no risk of illnesses, which is important considering the number of germs that live on the toilet seat. Light flush mode to drain light waste (400gm) in a single turn. It uses only 1 gallon of water. Heavy flush option to drain 1000gm of waste. It uses only 1.6 gallons of water. It has the highest Maximum Performance (MaP) rating, proving its reliability. It may be a powerful device but it’s very easy to install as it comes almost pre-assembled. You can, in fact, install it without having to hire a professional. There’s a pressurized rim feature that allows the water tank to trap water and get infused when the flush gets used. This pressurized water makes sure that all the waste is taken care of. The coating makes it easier to keep the toilet clean. Elongates shape and ADA certified. The seat needs to be bought separately. American Standard H2Option Siphonic Dual Flush Toilet is an economical dual flush toilet with some excellent features. It is easy to install, compact in size, and attractive as well. TOTO is a popular brand when it comes to toiletries. This one is a viable option especially for people who have smaller bathrooms. This wall mounted dual flush toilet is meant to last for years and is quite affordable as well. Offers a flow rate of 1.6 GPM. Contains a gravity-type flush system. Sturdy and able to withstand 300 pounds of weight. Elongated shape offers good comfort. Since this toilet can be wall-hung, it will occupy very little space in your bathroom. You can also hang the water tank on the wall, slightly above it. It incorporates a dual flush mechanism system that offers a light flush of 0.9 gallons and a heavy flush of 1.6 gallons of water. Don’t let its small size fool you. It is very comfortable and puts no pressure on the back or legs. Height can be adjusted as it’s a wall mounted toilet. Can be a bit difficult to install. TOTO Aquia Wall-Hung can be a good option if you are low on budget. It is quite affordable and can fit small spaces as well. Siphon Flush System: It uses the water tank to accumulate water and release it all at once to create vacuum and pressure. Gravity Flush System: It’s not as powerful as the siphon system but works well. It uses gravity to control the flow of water. Double Cyclone System: It incorporates a tremendous amount of pressure and is the most effective solution. Dimensions: Pick a toilet that can fit the space without any issue. Some options can be attached to the wall and can fit smaller spaces without any problem. Strain: This is an important factor. We can spend minutes sitting on the toilet seat, often putting a lot of pressure on the back. Make sure to pick a toilet that has the right height and a design that puts no strain on the body. Cleaning: Toilets with a nonporous glaze are easier to clean because they restrict the growth of mold and stains. Moreover, due to their slippery nature, no waste can remain stuck for long. Water Consumption: Choose a toilet that has a powerful flush mechanism that can drain waste in a single turn. Other Features: Some other features to consider include a temperature controlled seat, noise level, and automatic system. These are some of the best dual flush toilets on the market to choose from. Make sure to pick one that fits you the best.